To register: https://tinyurl.com/ybamssww or call (608) 663-6332. View the event flyer for more information, or contact us today! 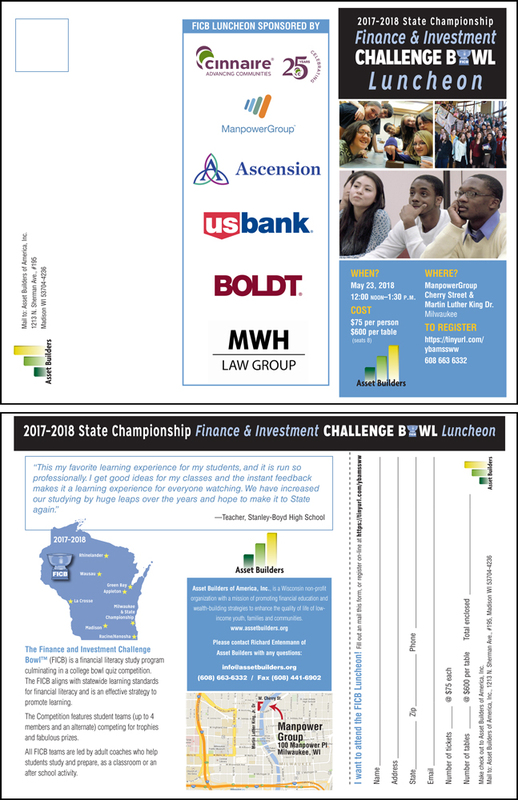 The Finance and Investment Challenge Bowl™ (FICB) is a financial literacy study program culminating in a college bowl quiz competition. The FICB aligns with statewide learning standards for financial literacy and is an effective strategy to promote learning. The Competition features student teams (up to 4 members and an alternate) competing for trophies and fabulous prizes. All FICB teams are led by adult coaches who help students study and prepare, as a classroom or an after school activity.